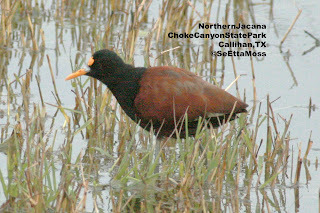 Count at Santa Ana National Wildlife Refuge which is located on the border of Mexico. Though small by National Refuge size at about 2,000 acres, approximately 400 bird species have been seen there. Named for the pine trees that are their usual habitat, this bird was foraging in some mixed tree species. 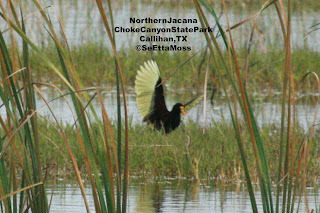 It was cloudy when I photographed this jacana and I am afraid that this ate up the color of the actually quite attractive yellow flight feathers causing them to look whitish in my pics. (this is not a result of editing). The bird flew several times as it moved around the shallow lake to forage in the vegetation. I was quite impressed by the long length of it's toes which are shown well in both middle pics. I am now down in Texas for some birding and for temperatures nicer than th 16 below, followed by 10 below, followed by 6 below zero we had in Canon City last week. 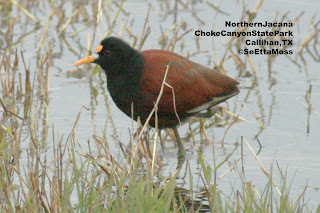 I had been following reports of a Northern Jacana that has been regularly seen in Choke Canyon State Park since early November. I didn't get to the park until early afternoon as it had been raining in San Antonio. A couple from Oklahoma found the bird on the far side of 75 Acre Lake. The husband was shooting pics with his 850 mm super telephoto lens and I was shooting with my combination (400 mm lens, 1.4 mm lens extender with an additional 1.6 multiplier since my camera is not full framed which gives me an effective lens a little over 850 mm). 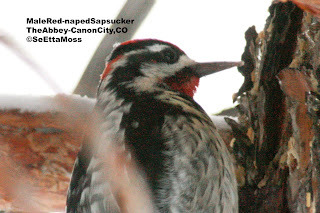 The top pic shows off the head pattern found on male Red-naped Sapsuckers--this one has a good patch of red on it's nape, red crown showing a little, bright red throat (distinctive of males), black and white facial stripes, frame around throat incomplete. In included the middle pic as I rarely get such a good shot of the crown which is quite red on this bird. 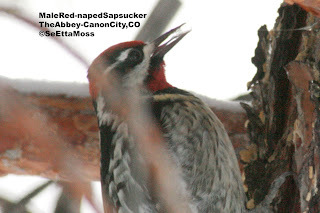 Now that I have posted pics of male Yellow-bellied Sapsucker at Centennial Park as well as the female Williamson's and Yellow-bellied Sapsucker at the Abbey, these are pics of the last sapsucker I found--a male Red-naped sharing the pine trees that are favored by all of these sapsucker species when they winter in Canon City. I really like pics in which I catch a glimpse of a bird's tongue like in the top pic here. 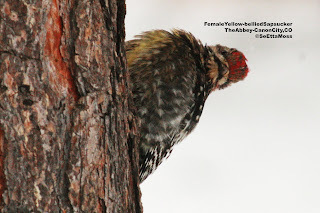 I noted in the last post on the female Yellow-bellied Sapsucker that they have fully framed throats while Red-naped Sapsucker's do not. This bird has a better developed frame than most Red-naped that I have seen, but the top 3 pics show that the frame is incomplete where the section bordering the face meets the section bordering the breast. The second pic also shows well the bright red throat feathers on this male. This is the female Yellow-bellied Sapsucker I found at the Abbey in Canon City, CO last week. I found her the same day I found a male Red-naped Sapsucker also at the Abbey. 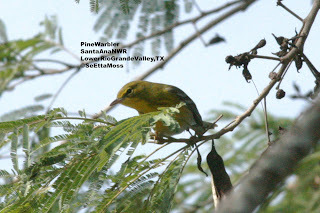 Though I didn't see the female Williamson's Sapsucker that day, it has been seen by others since these newcomers have arrived. Young male Yellow-bellied Sapsuckers can have throats that are mostly white but with a small amount of red so it is important to view the throat area fully as I did with these sapsucker.